Staff Sgt. Amy Tirador was killed under mysterious circumstances?shot in the back of the head on a U.S. military base near Kirkush, Iraq. Her family wants answers as the Army says it is investigating. In the 10 years since Staff Sgt. Amy Tirador's hair was cut at boot camp, she grew it back to its original length -- down to her hips. Every day until the night she was mysteriously killed in Iraq, Tirador, who worked as an Arabic-language interrogator, wrapped her long locks into a meticulous bun. 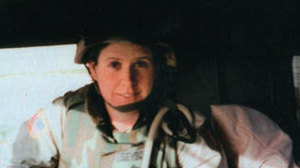 It's the image of her daughter tending to her hair -- even while serving in Iraq -- that Tirador's mother Colleen Murphy hasn't been able to get out of her mind since the 29-year-old soldier was shot in the back of the head while on an American base near Kirkush, Iraq, under suspicious circumstances. "Amy died on Nov. 4, while on a secure American base. Since then as far as information, I've only been told [her case] is simply under investigation. The military is being very closed-mouth. I have no idea what happened or how Amy died," said Murphy from her home in Albany, N.Y. When soldiers die, the military typically releases information about the cause of death soon after the family has been notified. In Tirador's case, however, her family has only been told her death is under investigation and that it could take months to determine a cause of death. Despite dying in an active war zone, the military has called Tirador's death a "noncombat-related" incident, adding an additional layer of intrigue and further raising the specter of foul play. Murphy does not believe there was a cover-up or that the military is stonewalling, she said, but she is desperate for answers -- and closure. "How could this have happened on a secure American base? I don't know why they can't rule some things out. This can't be a suicide. But there are so many probabilities and prospects and guessing games. They've given me no hints, and I can't stop thinking about all the different scenarios," she said. "Am I aggravated? Absolutely. Thursday will be a month. I want the truth. I will be patient and I will wait. But I want the truth," she said. Stationed at the Caldwell Forward Operating Base in Kirkush, in western Iraq near the Iranian border, Tirador was one of a handful of women on the base. For now, the Army is revealing little about the investigation, saying only that Tirador's death is being treated as a "homicide," which does not necessarily mean they believe she was murdered. "It is an open ongoing investigation and we're not releasing details until we've completed the investigation," said Chris Gray, spokesman for the Army's criminal investigation division. "Forensics investigators are looking at everything. They treat every investigation as if it is a homicide, which is not to say this is a homicide by any means," he said. Some reports have said Tirador was killed "execution style," but Gray said no information about the type of bullet or distance from which it was fired has been released. Tirador enlisted in the Army Reserve in 1999 and transferred to active duty in 2001. Originally trained as a medic, she volunteered to learn Arabic and attend a school to learn to become an interrogator. The military would not say if it believed she had been targeted because of her job, but her father, Gerard Seyboth, recently told WRGB-TV in Albany, N.Y., that he believed being an interrogator made Tirador a "high-profile target." New York Sens. Chuck Schumer and Kirsten Gillibrand, both Democrats, have each called on the military to conduct a swift and thorough investigation. "Sen. Gillibrand has reached out to the family. She has called for a full investigation and the military is currently conducting its investigation," said Bethany Lesser, the senator's spokeswoman. Tirador and her husband of three years, Sgt. Michael "Mickey" Tirador, were stationed together at Fort Lewis in Washington state and planned to purchase a home and start a family. Mickey was also serving in Iraq when he learned his wife had been killed. Tirador's body was met by her family at Dover Air Force Base in Delaware Nov. 6, two days after she'd been killed. The body was taken back to Albany and buried Nov. 17 at Saratoga National Cemetery. The streets between the family's home and the cemetery she said were lined with citizens waving flags to greet the casket. The family chose not to conduct its own second autopsy before burial, Murphy said. Murphy remembered her daughter as a pious and generous person who played softball and the trumpet in high school, and volunteered for chores at her local church. "I'm trying to stay strong," said the soldier's still grieving mother. "I'm going to see this to the end, until the truth comes out. She deserves the truth. This is one momma that won't stop until the truth comes out."